Weight (kg): app 200 - 400 kgs. Size given here is 4.5 metre width X 8/15 metres long. 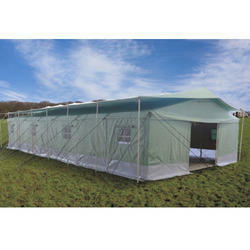 We have a highly advanced infrastructure that supports us in providing the best quality range of Hospital Tent. 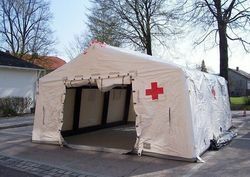 - These tents are used as a makeshift hospital or clinic during disasters times. Best in Quality Hospital bed side table with a shelve & drawer . We have tie ups with manufacturers in Asia to be able to supply quality Tents for Relief and Defence purposes at the most reasonable prices. -Defence tents to name a few. free standing fully collapsible frame tent finished with light weight waterproof polyester fabric .